It’s been a hell of a couple of weeks for me, and I imagine, for many of you too. The Olympics of course, plus some outrageously hot weather, the Great British Beer Festival, and all sorts of warm-weather based shenanigans to empty your wallet for. My GBBF coverage will find its way to Rum and Reviews Magazine shortly, but I thought I would share another recent and significant beer experience. Having finally joined the British Guild of Beer Writers(mainly to further my own ambitions, but also because I have always wanted to be part of a Guild), I was invited to a pre-GBBF event at the marvellous Porterhouse in Covent Garden (reviewed by The Gentleman Drinker here) to try out a wide selection of American craft beer in *DUN DUN DUNNNN* cans. The beer was excellent, and it got me thinking about beer’s relationship with aluminium, and what the future could hold. The humble can of beer has served us all tirelessly without complaint for decades, and yet, it has a serious image problem. We don’t see the can for what it is, we see it for what it isn’t. “I said where’s the BEER aisle not the insipid, corporate, industrial…” James Watt hated going to Tesco. The 440ml or 500ml can is the default beer SKU in the ever-growing off-trade, and pallets of them dominate aisles of supermarkets across the land. However, despite its ubiquity, or perhaps because of it, people don’t see cans of beer as quality items. There is always a perceived cheapness to them. The industry has come a long way from having tinny-tasting tinnies, but the association somehow lingers on. Bottled beer has perceived class, quality and tradition. Then of course there is bottle-conditioned beer, one of beer’s most important expressions. Secondary fermentation creates fuller flavours, natural carbonation and opens up the wonderful world of aged beer. Even CAMRA will occasionally reach down from Olympus and deign to label bottle-conditioned ale with their logo, designating ‘properness’. How are cans going to compete with that? In the UK’s current beer renaissance, how can the humble can share space with Kernel, BrewDog and Mikkeller in the hearts of beer geeks? Well, BrewDog have already bought into canning their beer, not in a big way, but both Punk IPA and 77 Lager are available. Surely, I hear you cry, that was just BrewDog doing one of their ‘clever ideas’ wasn’t it? Were we supposed to take them seriously? Well, BrewDog were simply emulating the American craft beer scene that they so desperately want to recreate here in the UK. American microbreweries (or rather, what they would call microbreweries) have been pioneering the idea of quality beer in cans for years, and I think it could be the way forward in the UK too. Why? Well, for one thing there’s the benefits to the brewer. Cans are cheaper, easier to produce, and easier to store and deliver. That could theoretically mean that smaller brewers find it easier to get their beer to more pubs and shops. 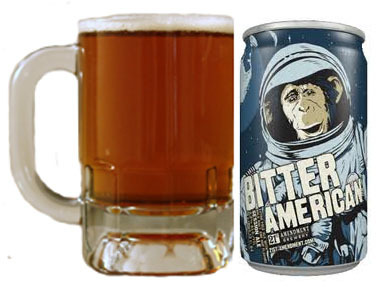 As I mentioned earlier, I was lucky enough to sample a selection of canned American craft beer recently, and on the basis of what I tasted, an aluminium-coated future does not frighten me in the least. I got to taste everything from the big-hitting mainstays like Sierra Nevada to smaller, kookier outfits such as 21stAmendment, Maui Brewing and Caldera. Of course, in American there’s no such thing as small, but these producers give us an idea of how smaller brewers have bought into the idea of canned craft beer, and they’re doing it well. Something slightly random but important that stuck with me afterwards is that cans have the better ‘opening noise’ than bottles. That sharp percussive crack and hiss flicks a switch in your brain that gets your mouth watering. What’s that about? As you can see above, with a change in packaging comes a change in labelling. With cans, the label ismost of the packaging, and most canned US craft beers have really eye-catching labels. There’s garish, gaudy colour schemes that remind you of vintage 60’s music festival posters, star-spangled red-white-and-blue palettes, or stark contrasting colour schemes with stencilled lettering and surreal art. They’re striking, they capture the eccentricity of the beer and its brewers, and most of all, they look good. Sometimes they look a little too good. 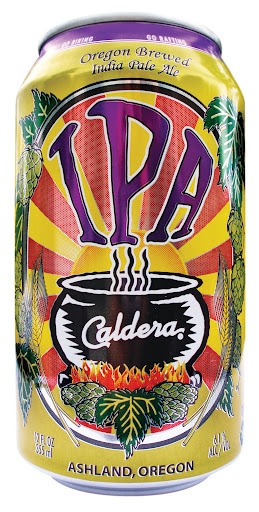 A few, including Caldera IPA (above) resemble some kind of tropical fruit drink more than a strong beer. It all comes back to quality. If the quality of the beer can be assured, then eventually beer connoisseurs will be won over. It doesn’t mean an end to bottles by any means. Rather, bottled beer, and bottle-conditioned beer in particular, will become even more special, even more rare and even more desirable. Cans will become the ‘norm’; beer of good quality to be enjoyed without fuss. Bottles will become valued possessions, encouraging more people to age their beer, and encouraging brewers to create beers that are designed to be aged. Imagine a world where this could be even more amazing than it already is. Ultimately, true beer nerds connoisseurs will pour the beer into a glass before drinking it, whatever the original vessel. The quality is not an issue – the beer tastes really, really good. The packaging is sharp and exciting, and I think it moves beer away from hefty, masculine pints and big bottles. I think cans make unusual beer like Coconut Porter, Black IPA and the like more accessible and less exclusive. What do you think? Can you see yourself drinking beers like those above? Is this inevitable, and what place will cask ale and bottle-conditioned beer have in such a future? I’d like to know your thoughts. I wrote a post about this the other week, and from discussion on Twitter after writing it seems that the biggest barrier might well be cost. As you alluded to, an American 'Micro' is liable to be an awful lot bigger than a British microbrewery, and unless set-up costs can be shared across several breweries over here I can't see it catching on in anything like the scale it has state-side. And that's not even beginning to approach customer perception! Punk IPA is one of the best lager i have drunk ! Next Next post: "It’s all just a bit of harmless fun."